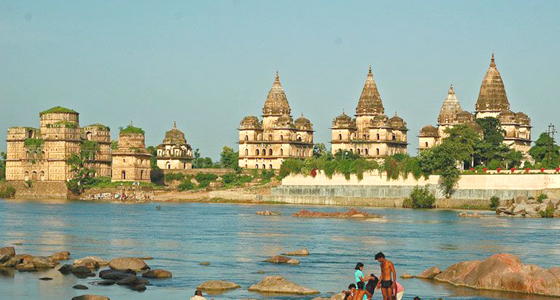 Nestled near the banks of Betwa River, Orchha is a beautiful tourist destination in Tikamgarh district that forms an integral part of the tourism in Madhya Pradesh. The name of the city means 'Hidden Place', which was established in the year 1501 by Maharajas Rudra Pratap Singh. It's one of the popular tourist destinations in the state that boasts off striking palaces, carved temples, forts and other structures. Travel attractions in Orchha including Laxminarayan Temple, Sunder Mahal, Chattris of Orchha, Ram Raja Temple, etc., make an inherent part of the tourism in Madhya Pradesh and add pleasant sightseeing tour in the district. Once you moved into by a gate, you'll find it's crowned with a beautiful red, elephant –headed Ganesh which gives a great pleasure to the heart. Tourists are mostly beguiled with its unique architecture and monuments of historical and religious significance. Travelling to this enchanting place will give you a beautiful journey of the bygone era and will get you through the record of medieval history. It brings out the tales of battles between kings and emperors. As per the legend, this town was built by Raja Rudra Pratap in the year 1501 which is at the distance of 16 Km from Jhansi in Uttar Pradesh. Annulated by rising hills, Orchha is wadded with sweet aroma of custard apples. This place was earlier ruled by Bundelas for two centuries which left a rich heritage to descendants as their architectural style was believed to be very unique. 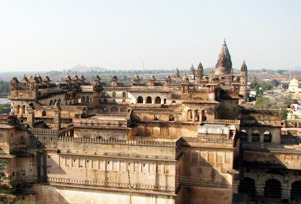 Orchha highlights the magnificence and splendour of the Bundelas. Snuggled in the lustrous Bundelkhand countryside, this beautiful place is bestowed with natural beauty and grandeur. It's a must visit destination that gives a delightful experience to leisure travellers. A small sleepy village encircled by a woody forest looks more beautiful with its majestic temples and garish monuments. Few major attractions like Dauji ki Haveli, Lakshmi temple, etc., shouldn't be missed by any tourist visiting here. If you want to soak in adventurous, religious and peaceful activities, then plan to visit Orchha and make your day pleasurable. Take a leisure walk and cross the bridge over Betwa River and retreat yourself in the dense woods. Pay a visit to a huge palace fort ‘Raja Mahal’ which is located to the right of quadrangle in Orchha, boasting of the huge towers laurelled by ‘Chhatris’ in its outer premises and antique mural paintings in its interiors. Take a saunter in the beautiful and intricately carved Jahangir Mahal built by Raja Bir Singh Ju Deo to remember the visit of Emperor Jahangir to Orchha. The Bundela School of Architecture, geometric patterns and the paintings of flowers and peacocks are the major draw of the Mahal. Go to see the Rai Praveen Mahal, the third splendid castle in Orchha built by Maharaja Indrajit Singh in the year 1618. Take a leisure walk in the lush garden where you’ll love to view the flowerbeds and shrubs spruced in several artistic shapes. Accommodation in Orchha is very easy as you can find a plenty of luxury resorts, heritage hotels and budget hotels. Orchha has few shopping places like Orchha Square from where you can buy Dokra crafts and Baster Traditional handicraft items in attractive prices. By Air: Gwalior Airport (131.5 Km) is the nearest airdrome which takes 2 hours 50 minutes to reach Orchha city. By Rail: Jhansi Railway Station (18.7 Km) is the nearest railhead to reach the city. It is well connected with major cities like New Delhi, Mysore, Puri, Agra, Jaipur, Bangalore and Lucknow through Tamil Nadu Express, Nzm Garib Rath, Karnataka Express, Punjab Mail, Rajdhani, etc. By Road: Orchha is well connected from Jhansi (16 Km) by road. Other cities which are also well connected from the city include Lalitpur (107 Km), Gwalior (119 Km), Isagarh (172 Km), Bhind (179 Km), Damoh (229 Km), Jabalpur (336 Km). Best Time to Visit: You may go through the best of Orchha from the month of October to March when the weather remains pleasant and it keeps it arms open for travel enthusiasts to explore the most famous tourist destinations of the state.